French scented candles enhance the mood of any room. Decorative wooden "leaves" in mahogany. Fragrance base in porcelain. A mature, essential perfume made from bergamot, orange, cedar wood, lily of the valley, amber and musk. Precious materials, like porcelain and mahogany wood, and elements inspired by nature, like twigs, shape the design. Literally "cocktail of peonies", this candle gives the home a fresh floral scent that is refined, gentle and elegant. Founded in 1760 and passed from father to son, Creed is the world's only privately held luxury fragrance dynasty. Based in Paris The dry, cold, almost astringent-like scent of these wild rose bushes, which grow against the wind on the Atlantic coast. The reconstitution of the fragrance of these ancestral roses was developed by Carlos Benaïm “au nez”, just by using his nose, much like how an artist would design an object. Editions de Parfums Frédéric Malle embodies traditional French perfumery at its best. Housed in an amber glass vessel, this vegan soy wax candle imparts a distinct scent that fills your space with aromatic serenity. Maui: Notes of sea salt, sea moss, and driftwood evoke a rising and falling tide on a secret beach, with just a touch of bergamot and ylang ylang. (FRESH) Santorini: Woodsy notes of sandalwood and amber form a rich, warm base for the earthy, fruity aroma of fig trees and lush currants. (FRESH) Italia: A fragrant blend of cardamom, vanilla, clove, incense, and orange blossom, with dashes of exotic spice inspired by a bustling Italian pasticceria. (WOODSY) Tuileries: Delicate notes of tuberose and muget dance above a heart of jasmine and gardenia anchored by a heady base of amber woods. (FLORAL) Scented candles come in lidded tins featuring original illustrations from our in-house artists! Soy wax candles are poured in the USA + topped with a 100% cotton wick for a clean, easy burn. Bloom: sparkling citrus elegantly blends with petal-soft lilies, crisp cedar wood, and seductive musk (FLORAL). Dwell: fresh eucalyptus sparks energy, while iced pepper, frosted lavender, and patchouli enhance focus (FRESH). Gather: crisp bergamot, plum, and sweet jasmine mingle with tonka, dark amber, and warm sandalwood (FRESH) Bloom: sparkling citrus elegantly blends with petal-soft lilies, crisp cedar wood, and seductive musk (FLORAL). Dwell: fresh eucalyptus sparks energy, while iced pepper, frosted lavender, and patchouli enhance focus (FRESH). Gather: crisp bergamot, plum, and sweet jasmine mingle with tonka, dark amber, and warm sandalwood (FRESH) Magnolia Home, a line of furniture and home accessories that suit a modern, mindful lifestyle. 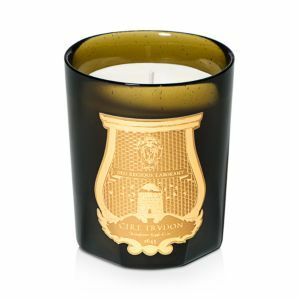 The classic Feu de Bois scent presented in a mouth-blown glass, colored during production for a shiny finish that lets you see the candle flame. Feu de Bois recalls the warm, familiar, sophisticated accord of rare woods throughout the long winter days. Evocative of lemon, this candle captures the fresh, fragile, fleeting scent released when the plant's leaves are rubbed. The classic Baies scent presented in a black glass container. Baies recalls a bouquet of roses and black currant leaves, a companion to Diptyque eau de toilette, L'Ombre dans l'Eau. The classic Tubéreuse scent presented in a red glass container. Candle wick Trimmer is perfect for trimming down the wick on your favorite Diptyque candle. This five-wick Feu de Bois scented candle recalls the warm, familiar, sophisticated accord of rare woods throughout the long winter days. The classic Figuier scent presented in a green glass container. Figuier recalls the warmth of fig wood, the freshness of its leaves and the milky sap. A companion to the Philosykos eau de toilette. The alter-ego of Oud Palao eau de parfum, the Oud candle takes you on a journey between East and West. A mysterious, woody, slightly animal composition enhanced by oriental facets of incense, and the warm, intense notes of patchouli and sandalwood. A walk in the mountains filled with the woody, pure and authentic perfume of the juniper. Rosa Geranium Candle: A subtle green fragrance made from the leaves of the Rosa Geranium plant that evokes the sun-flooded terraces of Mediterranean countries. Somewhere between vanilla and caramel, benzoin resin from Laos releases all the richness of the enigmatic mountains from which it comes—an enchanted journey of intertwining woody accords of patchouli and Indian cypriol. The classic Feu de Bois scent presented in a mouth-blown glass, colored during production for a shiny finish that lets you see the candle flame. Feu de Bois recalls the warm, familiar, sophisticated accord of rare woods throughout the long winter days. A bouquet of roses and black currant leaves, a companion to Diptyque eau de toilette, L'Ombre dans l'Eau. Mimosa flowers brimming with the scent of hay and honey, dotting hills with the sea in the distance. The scent of the sacred and precious sandalwood, which has filled the centuries with its dry, enigmatic fragrance A woody hot and cold atmosphere on the edge of the Mediterranean Sea ... The fragrance of this Diptyque candle liberates the intense aromatic freshness of the eucalyptus, heated up by the Mediterranean sun The classic Baies scent presented in a black glass container. Baies recalls a bouquet of roses and black currant leaves, a companion to Diptyque eau de toilette, L'Ombre dans l'Eau. This orange flower, so evocative of Mexico, sparkles with its bittersweet scent. The floral elegance of vanilla orchid gradually gives way to the intensity of the pod. Spices take precedence, blending with sandalwood and elemi to reveal a balsamy Bourbon Vanilla with smooth and woody accents. The delicate richness of the iris is captured perfectly in this intricately cast frosted crystal perfume bottle with an iris blossom as the stopper. 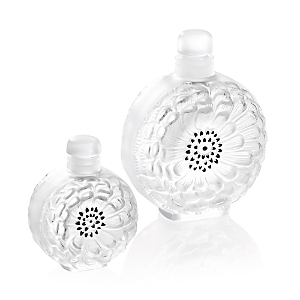 Handcrafted of lead crystal; no two will be exactly alike Handcrafted crystal perfume bottle. France Art glass perfume bottle. From the Arum Collection. Topped with a ginkgo stopper. Made in France. Crystal Handcrafted perfume bottle. Crystal and glass. Lily-of-the-valley stopper. Design first introduced by Rene Lalique in 1931. Perfume Basics: Fragrance consists of essential oils and alcohol. Essential oils carry the true scent and are costly. There are no international "rules" on definitions and required percentage of essential oil, but the concentration is progressively less from parfum (French)/perfume (highest), eau de parfum, eau de toilette, cologne (least), and the prices will reflect this. Body products ("fragrance layering") are good for your skin and make your fragrance last longer. Usually, body creme will be "perfumed" while other products are "fragranced."